In July 2012, the EU launched EUCAP Nestor, a civilian mission which assists host countries develop self-sustaining capacity for enhancement of maritime security. At its launch, EUCAP Nestor was mandated to work across the Horn of Africa (HoA) and Western Indian Ocean (WIO). As of the end of 2015, following a strategic review of the Mission, activities focus solely on Somalia (including Somaliland). The Mission Headquarters is currently located in Mogadishu. 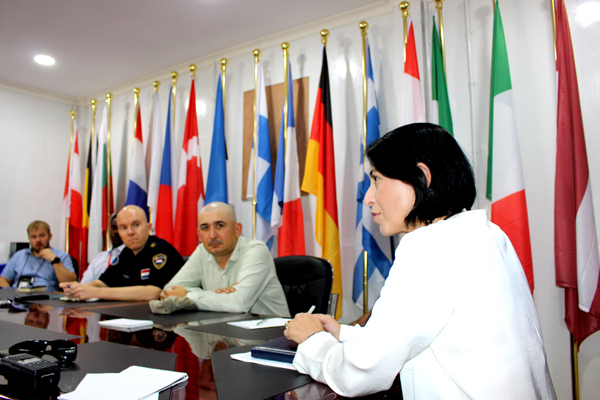 EUCAP Somalia Head of Mission, Maria-Cristina Stepanescu, a senior police officer from Romania, began her mandate on 1 September 2016. Following a proposal to the EU Political and Security Committee (PSC) by the EU High Representative (HR) for Foreign Policy and Vice President, Federica Mogherini, Ms. Stepanescu was appointed Head of Mission on 26 July 2016. Before joining the Mission, Maria-Cristina Stepanescu worked extensively in crisis management operations and worked in senior positions including the Romanian Ministry of Interior (Head of the Cooperation Unit/Schengen Department); the European Union Police Mission in Bosnia and Herzegovina (Head of the Programme Development and Coordination); United Nations Mission in Kosovo (Chief Investigator/Team Leader of Trafficking in Human Beings and Prostitution Unit, Serious and Organised Crimes of Pristina Region). From 2010 up to her appointment at EUCAP Somalia (then EUCAP Nestor), Ms. Stepanescu has been a Seconded National Expert/Police Expert to the European External Action Service (EEAS) in the Civilian Planning & Conduct Capability (CPCC), Operations division. The Head of Mission holds the national rank of Colonel. The EU works to contribute to the establishment of a peaceful, stable, and democratic Somalia and it is committed to sustainable development and to increasing stability and security in Somalia, in the Horn of Africa and beyond. A stable and secure Somalia means increased security for the population and the chance for it to benefit from the peace dividends. After 25 years of civil conflict, a Somali “Maritime Security Architecture” (institutional framework) needs to be restructured. This necessitates inclusive and long-term political and strategic-level agreements. Rebuilding of operational maritime law-enforcement capability similarly takes place with a long-term perspective and needs to be framed within the developing Maritime Security Architecture, the rule of law and human rights, and incorporating a gender perspective. In carrying out its mandate, in the spirit of the EU integrated approach, the mission cooperates with the EU Delegation to Somalia and the two CSDP military missions operating in Somalia (EU NAVFOR Operation Atalanta, EUTM Somalia); Coordination and joint activities also takes place with EU-funded agencies, such as the UN Office on Drugs and Crime (UNODC), as well as with the United Nations Assistance Mission in Somalia (UNSOM).